The holidays are here and many people have already had the experience of opening up storage boxes, only to find broken decorations. If you’ve stored your holiday decorations improperly, chances are, you are going to end up with some broken decorations year after year. 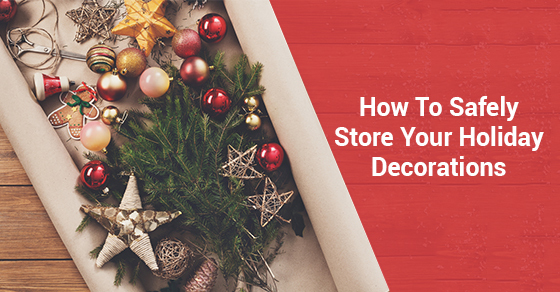 Below are tips for safely storing your holiday decorations. If you are like millions of people and have opted for the artificial tree in order to avoid the mess and cleanup of the real tree, then you’ve probably come to understand just how destructive those pointy metal branches can be. Avoid scratching your walls, and anything else you might have stored alongside your artificial tree by picking up an artificial tree storage bag to keep the tree, and everything else, well protected. It’s a cliche as old as putting up lights for the holidays is, but that doesn’t make it any less true. If you leave your lights in a bundle all winter, even if it’s a fairly orderly bundle when you place it in the garage, or storage space, it’s an inevitability that, come the following year, they are going to be in an awful tangle. Purchase yourself a wind-up light storage unit, which will guarantee you tangle-free lights year after year. Tangled lights can damage the wiring, as well as the lights themselves, costing you money. If you are like a lot of people, you have lots of tree ornaments. If you are even more like a lot of people, you don’t really have a proper storage system for these ornaments. They all just go in the ornament box. Invest in an ornament storage chest and make sure that you are safely storing those delicate, sentimental ornaments that you would like to keep in your family for ever. If you like your nativity scenes, or your holiday villages, or any other cute holiday scenes, then keep the boxes they came in. They are perfectly designed to fit in the boxes, and in addition to making sure that everything stays manageable and in the same place, you can ensure that none of the intricate little parts, figurines, etc., get broken during the off-season. Don’t take a chance with your holiday gear and decorations. You want these things to last for a long time, and maybe even get passed on to your children. Keep them safe and sound and be sure that you have them for this holiday season, next holiday season, and the rest of the holiday seasons to come.